Tiger Roll races to victory at Cheltenham. 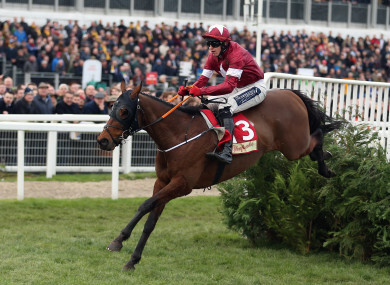 GIGGINSTOWN’S EDDIE O’LEARY has said that a call will not be made on Tiger Roll’s Aintree Grand National participation until closer to the time. After recording back-to-back wins in the Cross Country Chase at Cheltenham on Wednesday, Tiger Roll’s odds shortened to a general 6-1 to defend his crown on 6 April. One of seven horses to carry the maroon and white of Ireland’s champion owners to victory at the festival in 2018, Tiger Roll was Gigginstown’s sole success at Cheltenham this year. “Tiger Roll is an absolute superstar and we were delighted with him in the cross-country,” said O’Leary. We haven’t even begun thinking about what we’ll do with him next but I know Michael is concerned about what’s best for the horse. Meanwhile in action today, the long-awaited return to action of the Willie Mullins-trained Carefully Selected had to wait until Limerick on St Patrick’s Day, and the son of Well Chosen made it a winning one as he landed the 2m 6f maiden hurdle on the card under Gold Cup-winning rider Paul Townend. The 1-3 favourite, runner-up in last year’s Cheltenham bumper, mostly jumped well but was put to the pin of his collar by 20-1 shot Lord Schnitzel who looked to be holding on until the winner went past on the run to the line. There should be much more to come. Email “Eddie O'Leary remains coy over Tiger Roll's Grand National participation”. Feedback on “Eddie O'Leary remains coy over Tiger Roll's Grand National participation”.